Russell Wood and Mark Llewlyn of Wood Ag. 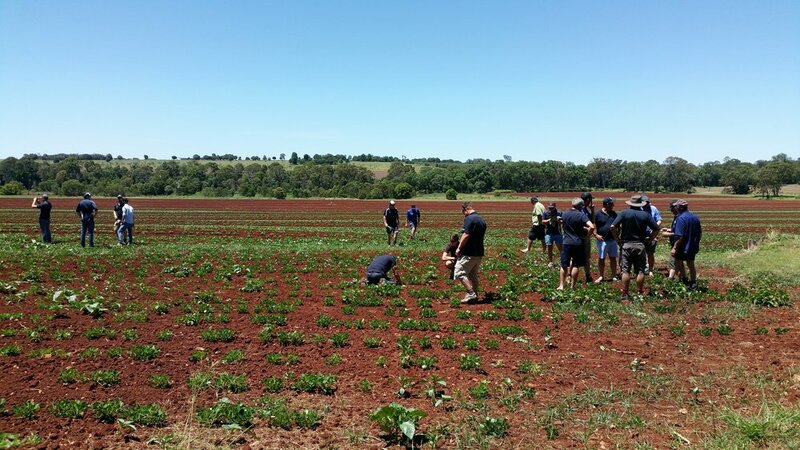 in Chinchilla recently visited Kingaroy with a group of agronomists from all around Australia to visit Bean Growers Australia, the DAF Research Station and the farm of Alan Sommerfeld. The agronomists were all members of the National Rural Independents (NRI) group. At the DAF Research Station the agronomists went over various breeding programs and toured the nursery. The group then came to Bean Growers Australia to learn about the history of growing in our region, as well as a tour of our world-class grading and bagging facility. Lloyd Neilsen lead the tour. Most agronomists had never seen how crops are processed once they leave the paddock, so they got to see how our experienced operators and new technology can maximise yields for growers, while still maintaining a quality product for our customers. After a tour of our facility the group was keen to see some of Kingaroy’s famous red dirt for themselves (as well as a peanut crop), so Troy Watterson took them to visit Alan Sommerfeld’s farm just outside of Kingaroy. Allan was kind enough to share his decades of experience with growing all sorts of crops in the region. It was a fast-paced day full of learning and laughs for a group that had travelled far, and all had an enjoyable day in Kingaroy. Thanks to Russell Wood for letting us share our pride in the South Burnett. Posted on March 16, 2018 by Shane Lougheed.